We have a beautiful outdoor patio available for rent, as well as a gorgeous lawn area. 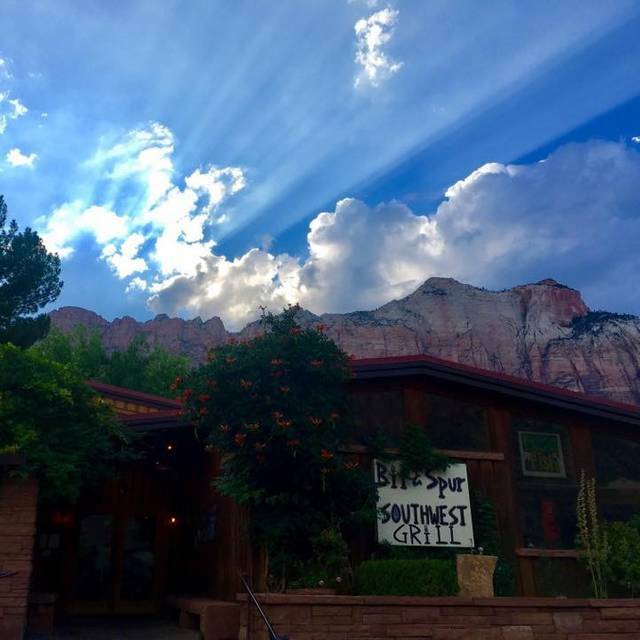 The Bit and Spur Restaurant and Saloon, located in Springdale, Utah, at the entrance to Zion National Park, has been the restaurant of choice for locals and tourists since 1981. With Southern Utah’s largest selection of micro-brews and fresh fruit margaritas, we are also the watering hole and gathering place of choice. 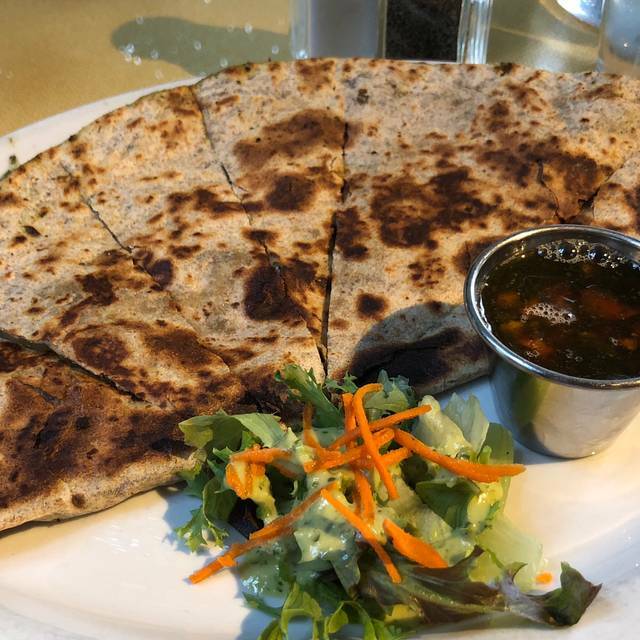 You will be sure to have a memorable evening of great food served by a talented staff in a warm and friendly atmosphere. Our dining room features different art exhibits throughout the year and our extensive patio boasts a sunset and garden view. We were not sure what to expect but it was recommended by a friend. The food was so delicious- highly recommend the swordfish tacos! Service was great, friendly staff, and our kids enjoyed it as well. Great food in a fun and lively restaurant. Fantastic friendly service!! We didn’t have a very good experience at this restaurant. Service was pretty good but the food was bland and didn’t seem to have been prepared in a skilled manner. I would not recommend this restaurant. Service was a standout. The waitress had two helpers and all were pleasant and friendly. We ordered ribeye steaks that would have been better if cut thicker and bone-in. They were cooked correctly and in a tasty southwestern chili sauce. Loved the fried onion strings. Black beans and rice were very good. I did not care for the salad dressing. It might have been a purée cucumber and cilantro concoction. The mixed berry crisp and vanilla bean ice cream was wonderful. Rude wait staff. Some, not all staff would not look at you when they served dishes. Everything was delicious & such a nice atmosphere. Would definitely recommend for a good dinner experience. Our night at Bit and Spur was absolutely great! The food was fantastic from the chips and guac to our entrees to the desserts. 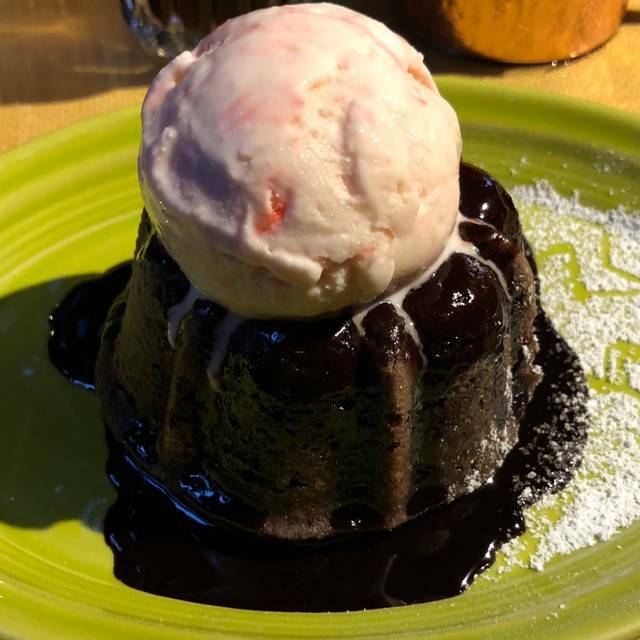 We were in Zion for spring break with my husband and three teenage boys and we all loved what we ordered, everything was fresh and quite flavorful. The portions were good sized, no complaints from teenagers anyway. Our waitress was very friendly and came and went at a nice pace (not nosy, but never disappeared on us either). Definitely go there for dinner while in Springdale. I loved the atmposphere and the food was incredible! It can get a little noisy but great place for kids and everyone of all ages. If you are looking for ideas, the house margarita and shrimp tacos will meet if not exceed your expectations! The Bit and Spur food was not up to the level we had the last time we dined there. It's interesting that the restaurant was not as full as it was the last time when the food was better. Great for a Valentines dinner with kids & grandkids! The service was outstanding and the food was absolutely delicious. We enjoyed great service, out server gave us a taste of something unusual. Friendly staff. Great cocktails. house made hot sauce. Very convenient location to Zion. You can't miss the bright lights when you're traveling down the road to place. Very nice staff and good food. You can have the standard seating or the bar - menu is the same in both locations. We had the shrimp tacos and the steak plate. The steak alone was a big portion. The shrimp tacos had a nice zest and the ingredients were a great mix of textures. Recommend this place after a trip to Zion. This restaurant was recommended by friends. They said the food was good and the ambiance was quirky. It didn’t disappoint. The food was delicious. Mexican with a twist. Highly recommend the Chili Verde Burrito. Soooo good. The artwork is electric and bright, and the decor is inspired by Mexico but with a different flare. I wish we would have had more time to spend in the bar, but it was a quick trip for us. We def plan to come back. I have loved this place since they first opened. I only wish they could stay open through the winter, but I get it that they also have lives. Lovely spot with great people and superb service. Our simple drinks were good. We enjoyed eating there two nights in a row while visiting Zion Natl. Park. The steak skewers, rubbed ribeye steak, fish tacos (mahi-mahi), and pork chili were all very good and I'd order them again. The pork and the mushroom tamales were just so so. Would definitely return there. The Bit & Spur is an old favorite of mine but I hadn't been there for a few years since I'd been away from the area. Glad to see it's as good as ever if not better. Very interesting and Southwest-oriented menu with wide variety, relaxed, funky atmosphere, and a view that can't be beat. Service was rushed. Food good. Wouldn’t probably bother coming back as so many other good options in Springdale. We ate here during a trip to Zion based off a write up in sunset magazine. It was a Saturday night and it was packed! The Tex mex food was ok and not worth the price. They were out of four dishes we wanted and the waitress was unapologetic. They even ran out of guacamole! What Mexican restaurant runs out of gaucamole?! The service was mediocre. The ambience was the best part. Fun and lively,except for the waitress who was stressed and unfriendly. Not sure there are a lot of other choices in Springdale, but I would look elsewhere before going here. If you have to have Tex Mex go on a quiet night when they don’t run out of everything and the wait staff is happier. We were looking forward to a great meal because of past reviews however, we were disappointed. Nice dining atmosphere. Good start with the guacamole which was very tasty. Our meals were hardly warm. Rice and beans were bland. Pricey for the amount of food served. Service was chaotic the night we dined here. Admittedly, the restaurant was crowded, but server appeared overwhelmed. Forgot to bring the wine I'd ordered until the meal arrived. On the other hand, the outside patio was a comfortable setting and the hostess worked hard to find us a place there. Didn't tell from OT reservation that preference for outside was required. Food was tasty and wine selection most extensive we'd seen in southern Utah. Just wish it had arrived on time. Excellent food and server. We went to the Bit and Spur twice in our stay in Springdale. Both times we were served by Kerry, who was very helpful. We had their special guacamole, which was great. I'm not sure why it's not regularly on the menu. We also enjoyed the polenta stack and chile relleno main dishes. We loved the crostini with roasted garlic and steak skewers starters. I had a great sangria. Our only concern was the noise level inside. The first night, they had loud obnoxious music, which prompted us to ask to be seated outside. The second night, they had two large groups and it was extremely noisy, so we asked to be seated outside right away. Fortunately, the weather cooperated, but this could be a problem if you don't want to eat outside and loud noise bothers you. Average quality, we ordered the ribs, they were just ok. Didn’t fall off the bone as I prefer. We’ve been to Zion 10 times, and feel lucky to have found this place early on. We go every year! 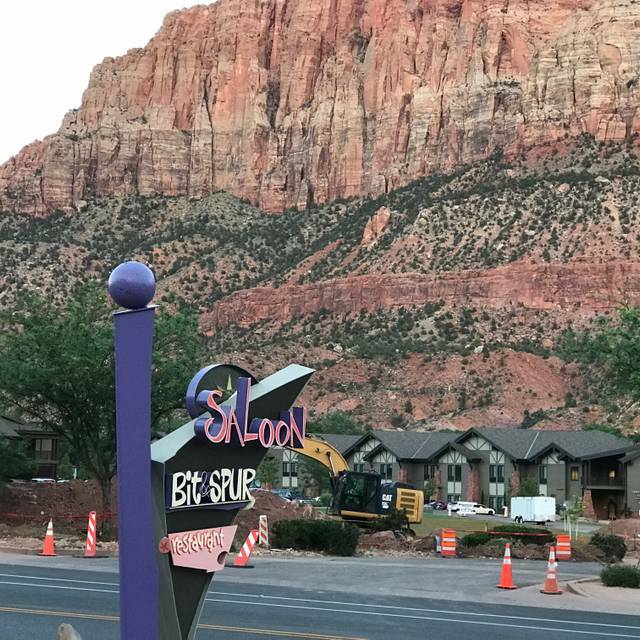 Every time we visit Zion we make sure to stop in for dinner. Always great service, good margaritas and fantastic food! We wish it were closer to home. Employees acted as if they could care less if we were there. We received a friendly welcome and we were seated immediately with our reservation. We had senior adults all the way down to youngsters and all of us were very happy with the meal choices. The drinks were wonderful as was the beer. We all loved the Guacamole and our mexican food meal choices were delicious. The staff was incredibly patient, friendly and very competent. We'll be back the next time we pass their way. We read reviews and made a reservation prior to our trip to Zion. We were very pleased with both of our meals. 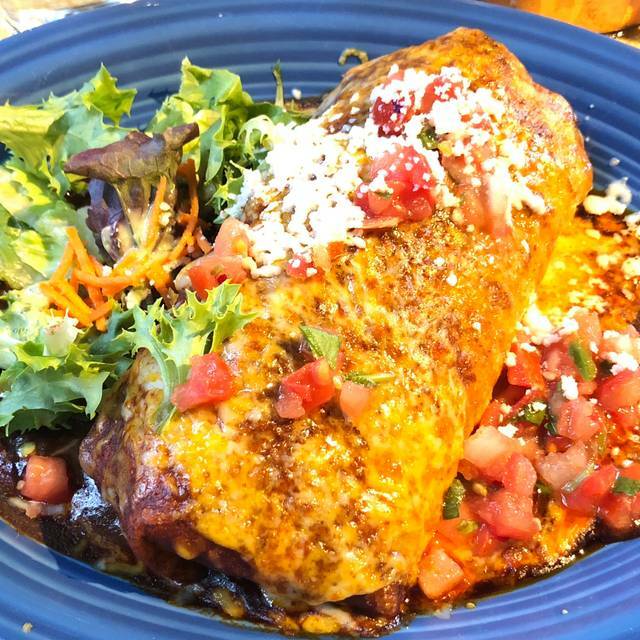 The pork burrito was so flavorful and loaded. The Carne Asada was excellent as well. The guacamole and chips were an excellent starter. The Mango Margarita was delicious and refreshing. Dessert put us over the top but was worth it. Great ice cream and berry crumble. Would definitely go again. Great food. My daughter has celiac and they were great with Gluten free options. Fantastic rear outdoor seating and excellent food. Servers are friendly and helpful. Me and my wife rode our motorcycles 650mi to eat here. We do it every year. ‘Nuff said. The food was delicious. I had the tamales and they were great. Although it was hot, we sat outside and it was beautiful. This was our best meal in Zion and Bryce.